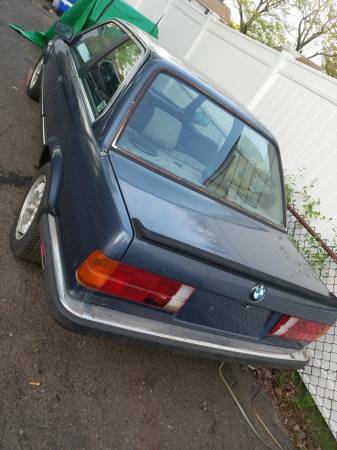 Not too many years ago, you could pick up a clean BMW E30 for reasonable money. It is a completely different market for these cars in 2018. Nice condition plastic bumper cars are very difficult to find under ten grand. Today's feature is a interesting euro import that could be a really nice car with a little handiwork and ingenuity. It is equipped with the low revving diesel-esque 2.7 "eta" inline 6 engine. All is not lost because the hot-rod solution is to fit an "i" engine cylinder head onto the "eta" block to create a 2.7 stroker. The "i" cylinder heads are plentiful and not overly pricey. Without proof of it being done, you should change out the timing belt and water pump on on these engines right away so this would not be a ton more extra work. 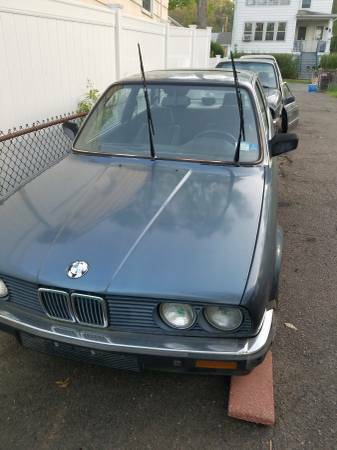 Find this 1985 BMW 325e for sale in West Haven, CT for $4,000 via craigslist. This is a magnificent car just needs some love. Car runs but currently needs clutch and slave. Car has full Houndstooth Sport Interior. Came with military package including fire extinguisher, First aid kit, full power Windows, locks and sunroof. Car is a early model so it has rear pop out windows. Euro bumpers are clean but front seats are torn. Known first owner my whole life looking to sell to a good owner. More pictures to come. 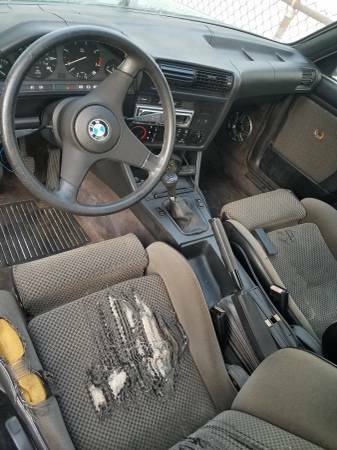 The cool euro touches include the very hard to find metal bumpers, military package, houndstooth (need some love) cloth sport seats, sport steering wheel, and rubber rear spoiler.. The bumpers are a quantum leap better looking than the ungainly USA bumpers. "front seats are torn" that might be the biggest understatement ever. Was this the test car for the scene in the Hangover where they put a tiger inside a car? Too much Taco Bell will do that to a seat. MFD by... Daimler? (from the VIN/import tag on the driver's b-pillar). Hey guys! I am the person who bought this car. Boy is she turning into a project. Crank sensors are bad, clutch actually worked fine. Brake and fuel lines rotted and are being replaced fully. Really beautiful car! gonna be a great project.